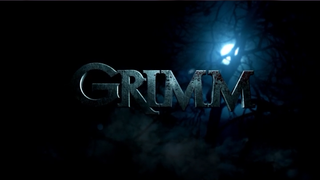 I was thrilled when I first heard about a new TV series called Grimm, last year. After all, I write books based on folklore. My interest was also piqued by the fact that David Greenwalt was one of the creators/writers of the series - he is the co-creator of both Buffy the Vampire Slayer and Angel. The fantasy crime drama is set in Portland, Oregon; a refreashing change from the usual LA/NY crime scenes. David Guintoli is cast perfectly as Detective Nick Burkhardt, the darkly handsome Grimm. His partner, Detective Hank Griffin is played by Russel Hornsby. However, Hank appears confused and out of his depth most of the time (maybe he was meant to be!) in the first series. The love of Nick's life is Juliette, a vetenarian. Played by Bitsie Tulloch, Juliette is beautiful but quite uninspiring. The casting of Silas Weir Mitchell as Munroe, a shapeshifting Wieder Blutbad (big bad werewolf) is a stroke of genius. His friendly, laid-back character is a perfect foil to Guintoli's intense Grimm. Munroe later develops a relationship with a friendly Fuchsbau called Rosalee Calvert (Bree Turner) who runs an apothecary for the wesen community. Rosalee makes potions to counter the illnesses and break the spells which sometimes afflict the wesens. Munroe and Rosalee are two of the most engaging and likeable characters in the series. The plot thickens when we find out that the Head of the Police Department, Captain Sean Renard (Sasha Roiz) is somehow linked to the dark world of the wesen. Renard turns out to be a Reaper (Grimm Reaper?) - a strong and complex character whose allegiance is uncertain. Renard is assisted by a young lawyer called Adeline Schade (Claire Coffee), who appears to be in love with him. It turns out that Adeline is actually a Hexenbiest (wicked witch), a creature of pure evil. There are a few disappointments in the series. One of them is the death of Nick's Aunt Marie (Kate Burton), who is a formidable Grimm herself. She was the one who raised Nick as a child and passed on the mantle of Grimm to him. She also bequethed to him a trailer full of fearsome mediaval weapons and ancient books on Grimm Lore (mostly in German)! The death of Angelina Lasser (Jaime Ray Newman), a fiery red-haired Blutbad, who was also Munroe's ex-girlfriend, is another loss. Angelina is riveting as a female Blutbad. Another disappointment was the fact that as a Grimm, Nick had to rely on weapons to fight the wesens and seemed incapable of defending himself. Thankfully, he later acquires/develops Slayer-like powers! Yet another irksome fact is the wierd names given to the wesens; Blutbad for a werewolf, and Hexenbiest for a witch? Why not stick to the terms we are all familiar with? I also noticed that while the animal shapeshifters look slick and handsome in their wesen form, the Hexenbiest and Reaper looked hideous and zombie-like, with rotting flesh. Could this indicate that the wesens like Munroe and Rosalee are not really evil, just following their animal instincts? The other point I'm wondering about: does the Grimm also has a different face? What does the Grimm look like to the wesens? 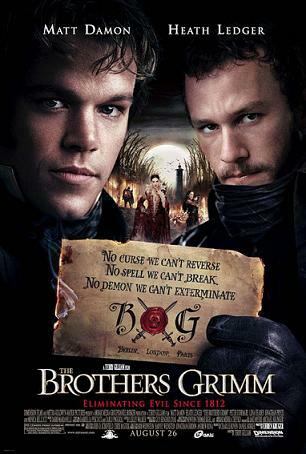 While on the subject of Grimm, I will make a detour to that fabulous movie, The Brothers Grimm. Released in 2005 (was it that long ago? ), it starred Matt Damon as Wilhelm Grimm and Heath Ledger as Jacob 'Jake' Grimm and directed by Terry Gilliam. Apparently, they were cast against type - the larger than life Ledger played the introverted Jacob while the more thoughtful Damon played the confident, outgoing Wilhelm. It was wonderful nonetheless, to see Matt Damon's bright side! The filming on location in the Czech Republic gave the movie the dark brooding atmosphere, medieval castles and villages and the enchanted forest every fearie tale needs. In the movie, the Brothers Grimm are travelling con-artists who use their knowledge of German folklore to perform cleverly executed 'exorcisms' to earn a living. However, they are captured by a French General called Delatombe (with the help of Italian inquisitor Cavaldi) and forced to confront a genuine fairy tale curse, on pain of death. The brothers have to muster all their resources to break the curse in a village called Marbaden, where young girls have been disappearing every night. With the assistance of a strong-willed huntress called Angelika, (Lena Headey), the brothers set out to rescue the children and lift the terrible curse. The Mirror Queen was also a witch who collected (stole) the spells of the local villagers. She was able to steal all but one of the spells before a plague ravaged the village and the castle. The queen locked herself in the castle tower to escape the plague and cast a spell on herself and her surroundings, which kept her alive for hundreds of years. But unlike Sleeping Beauty she aged and become decrepit. Only her mirror reflected her true beauty. Perhaps this was because she could not steal the last spell to complete her magic? The breathtakingly beautiful but evil queen (Monica Belluci), is a complex composite of several fairy tale characters - she is Sleeping Beauty (she put a sleeping spell on herself to escape a plague), Rapunzel (she is locked away in a tower which protects her but is also her prison, and has hair which has been growing for centuries!) 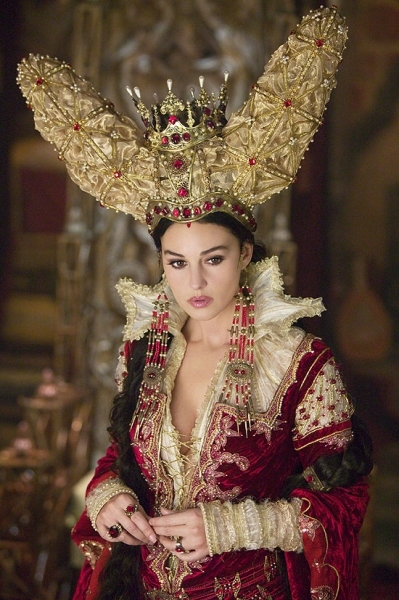 and of course Snow White's wicked step-mother, the Mirror Queen. In fact, I suspect she is both Snow White (skin as white as snow, lips as red as blood and hair as black as ebony) and the wicked queen! Futhermore she is also a vampire who needs to drink the blood of 12 virgin girls to restore her youth and beauty. based on a German folk tale. Most of these fairy tales have been made into films. The most notable being EverAfter, a retelling of the Cinderella story, directed and written by Andy Tennant. It stars Drew Barrymore as a fiesty, funny and very strong Cinderella who is also intelligent, well read and articulate! Her performance in this movie as Nicole is luminous and riveting. Angelica Houston plays the mean and severe step-mother. We all know that Houston does 'wicked' really well from her performance as the queen of the witches in The Witches; a truly entertaining, funny and scary film based on a book by Roald Dahl. Actually, I expected her to be cast as Prof McGonnegal in the Harry Potter movies but it was not to be so (sigh). Confessions of an Ugly Step-Sister is another re-telling of the Cinderella story; the movie is based on a novel by Gregory Maguire. For me, Bernadette Peters steals the show as the 'wicked' step-mother in Confessions from both Cinderella and her 'ugly' but talented step-sister! 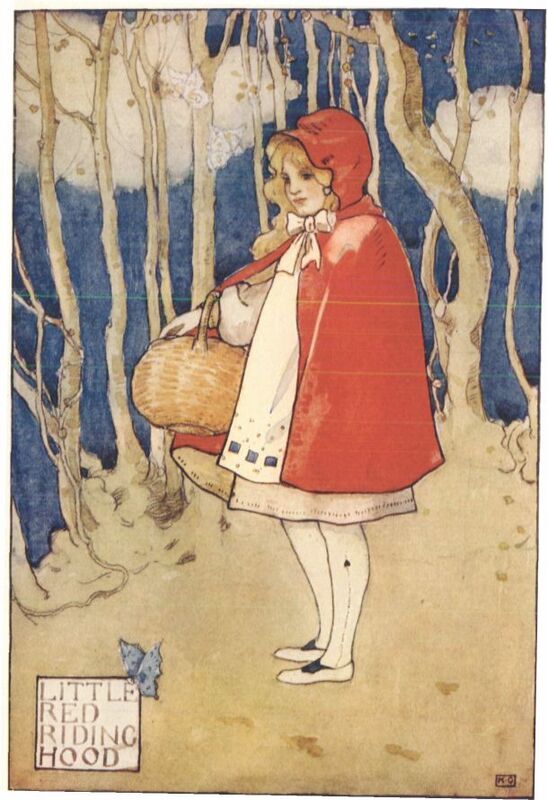 Gregory Maguire is most famous for his book, Wicked, which is a retelling of The Wizard of Oz, perhaps the most famous fairy tale to originate from the US, although Washington Irving's Legend of Sleepy Hollow is a strong contender. Charles Perrault: Cinderella, Sleeping Beauty, Puss in Boots, Red Riding Hood and Bluebeard. The Brothers Grimm: Hansel and Gretel, Snow White, Rapunzel, Rumplestiltskin and The Frog Prince. They also retold Red Riding Hood, Cinderella and Sleeping Beauty. Hans Christian Anderson: The Little Mermaid, The Ugly Duckling, The Snow Queen, Thumbelina, The Emperor's New Clothes and The Princess and the Pea.